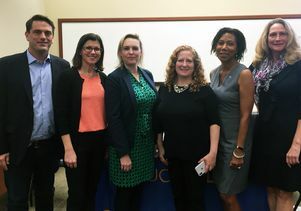 Dean Jennifer Mnookin, fourth from left, said as a public university law school, UCLA Law must take a leadership role in shaping how sexual harassment is prevented. Mnookin also noted that UCLA Law was home to some of the earliest scholars in feminist law and women’s rights, and it has graduated scores of women trailblazers in the legal profession and the business world. 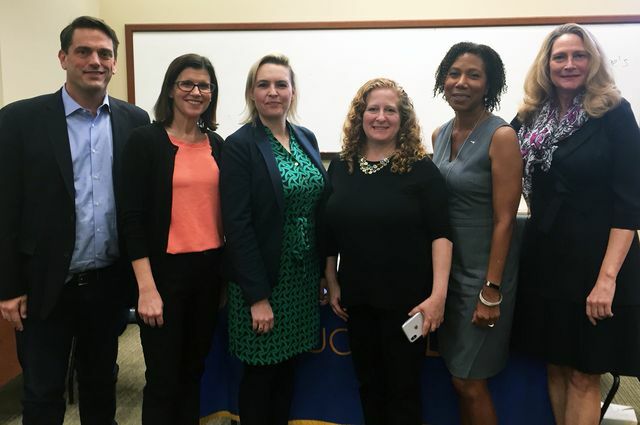 The first town-hall conversation, “Navigating Sexual Harassment in the Legal Profession,” featured four leaders whose work addresses sexual harassment in legal and academic settings: Betsy Butler, executive director of the California Women’s Law Center; Amber Phillips, UCLA Law alumna and trial attorney with the Genie Harrison Law Firm; Kathleen Salvaty, the University of California’s Title IX coordinator; and Brenda Sutton-Wills, UCLA Law alumna and staff counsel for the California Teachers Association. Their discussion centered on instances of sexual harassment that are particular to law firms and other parts of the legal profession. Panelists discussed ways in which people might respond to situations such as a law partner persistently inviting an associate for cocktails or a professor making unwanted sexual comments to a graduate student. Sutton-Wills offered a standard by which women and men could determine whether certain conduct is appropriate: Would any person’s spouse or parent think this kind of behavior is OK? “Can this be debriefed?” she asked. 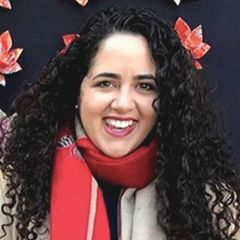 Phillips said that reporting instances of sexual harassment is vitally important, certainly for any possible legal action, but also as a way of raising awareness. That, Butler added, offers key support to survivors who may not otherwise speak up. “This is an ongoing conversation, and it has to be out there,” said Salvaty, who added that her office seeks to eliminate such conduct throughout the UC. 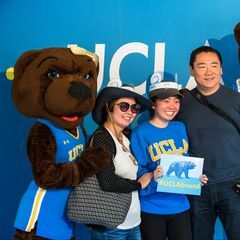 She stressed the Title IX office’s efforts to improve policies and procedures for reporting and adjudicating sexual harassment claims, and its work in creating better confidential resources for people who work and study in the UC system. The panel was introduced by Brad Sears, UCLA Law’s associate dean of public interest law and the David S. Sanders Distinguished Scholar of Law and Policy of the Williams Institute, who is administering the series. It draws additional support from more than a dozen offices and centers within the law school and is sponsored by the Margaret Levy Fund. Topics for the rest of the series include “Re-Centering the Conversation to the Margins: Race, Gender, and Low-Wage Work” in February, “Sexual Harassment and Hollywood” at the 42nd Annual UCLA Entertainment Symposium in March, and “Policy Forum: Addressing Sexual Assault and Harassment on California’s College and University Campuses” in April.